Brackley Town were comfortable 2-0 winners at Chesterfield in Saturday’s third round tie. Both goals came in the second half at The Proact from top scorer Lee Ndlovu, with his 16th of the season, and Jimmy Armson. 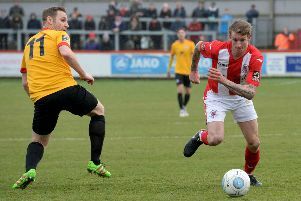 It was no more than Saints deserved against their Vanarama National League opponents and Kevin Wilkin’s side could have won by a bigger margin in the end against a shaky home defence, with keeper Shwan Jalal coming to his side’s rescue several times. Saints began well and Ndolvu fired wide from the edge of the box before the Spireites enjoyed their best spell of the tie. Defender Haydn Hollis saw his header from Curtis Weston’s delivery comfortably dealt with by Danny Lewis who then got down well to deny Kyle Reid. But Saints took over after that and Jalal tipped away Armson’s curling effort after Ndlovu capitalised on hesitancy from Hollis. The visitors continued to threaten on the break and a poor clearance from Hollis fell to Shane Byrne who fired over. Saints went close three times in quick succession midway through the first half. The unmarked Ndlovu was denied by Jalal from close range, Byrne’s follow up was cleared off the line by Will Evans and Hollis headed clear before Armson could pounce. But Saints finally broke the deadlock seven minutes after the restart. Chesterfield failed to deal with a ball in the box from Byrne and Ndlovu made no mistake to stab the ball home from close range. Spireites boss John Sheridan made a double change but it made little difference to stem Saints’ attacking threat. Armson released Ndlovu who was denied by the advancing Jalal. Chesterfield rallied and Joe Rowley’s corner was helped on by Evans to substitute Lee Shaw who was denied by Lewis. But Saints doubled their advantage in the 76th minute when Armson raced on to a through ball from Adam Walker and beat Jalal via the upright. 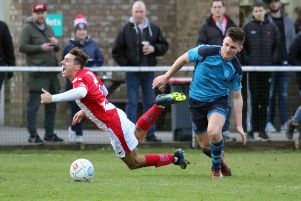 Shaw volleyed over the bar late on and substitute Louis Dodds saw his drive saved by Lewis but Saints managed to see the game out with another clean sheet to book their place in Monday’s quarter-final draw.